The workplace continues to evolve and hiring managers are looking for candidates with more than just the basic core competencies to get the job done. They’re looking for personal qualities and a can-do attitude that make someone a good employee and compatible to work with. In short, they’re looking for candidates with the right mix of hard skills and soft skills. 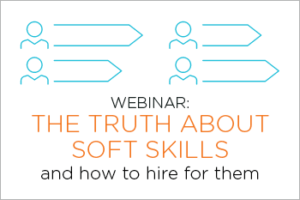 Gain valuable tips and uncover strategies on ways to include soft skills as a part of your organizational culture and make finding top talent a cinch!